An announcement is expected at a press conference at the European Tour’s Wentworth headquarters. The 47-year-old Irishman also has good experience of the course in Wisconsin having played there in the US PGA Championships of 2004, 2010 and 2015. Bjorn and past captains Darren Clarke and Paul McGinley are on the panel that selects the next captain along with European Tour chief executive Keith Pelley and a member of the Tour’s Players Committee. 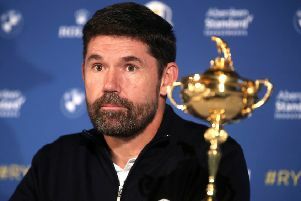 Harrington became the favourite after Lee Westwood, the other main candidate, indicated a preference to do the job in Rome in 2022. Europe have dominated the Ryder Cup in the modern era, winning nine of the last 12 matches. American Xander Schauffele tied the course record with an 11-under 62 to win the Sentry Tournament of Champions. He beat compatriot Gary Woodland by just one shot, having started the final day in Hawaii five shots adrift of the lead. Rory McIlroy – making his debut at the event which consists only of PGA Tour winners from the previous calendar year – finish tied for fourth.